Without a properly working power converter, RV appliances and electrical fixtures won’t run. The converter ensures that power is properly distributed throughout the RV, 12V is supplied to the DC systems when the RV is plugged in to shore power or running off generator, and the house batteries are kept charged. It is one of those “out of sight, out of mind” devices. However, an alternative to a converter is an inverter. This article will compare the functions of the converter and inverter. While there are many different types and sizes of inverter, we will focus on the larger, permanently installed types that also incorporate a battery charger. Whether converters are stand-alone or modular, they all perform the same three primary functions. First, the device converts some of the incoming 120V AC to 12V DC power for the house system when the RV is connected to shore power or generator. This prevents the house batteries from being drained when the RV has 120V power, and is the function for which the converter is named. An inverter does the opposite and connects directly to the RV batteries to invert (and rectify) the 12V DC to create 120V AC output. Unlike a converter, an inverter creates AC power without the need for shore power or a generator. Converters also provide a means to distribute power to the different AC and DC circuits in the RV. This power distribution system takes the main power coming from the shore line or generator and distributes it to different branch circuits through individual breaker switches. There is a separate fuse panel for the various 12V house systems. 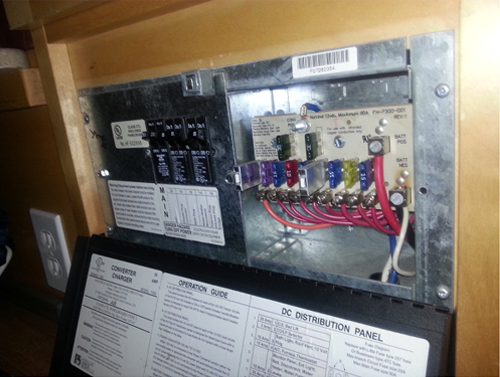 Inverters do not have a distribution system built-in, so require separate fuse panels and breaker boxes to be installed. If you find that you are missing some AC or DC power in your RV, inspecting the circuit breakers and fuses first is suggested. Finally, both converters and inverter/chargers keep the house batteries charged whenever the RV is plugged in to shore power or the generator is running. It should be noted that while converters incorporate a battery charging feature, the charging current available is often quite low. This means that these converters are not able to properly charge house batteries that are at a low state of charge. Stand-alone high-output battery chargers are required for this purpose. 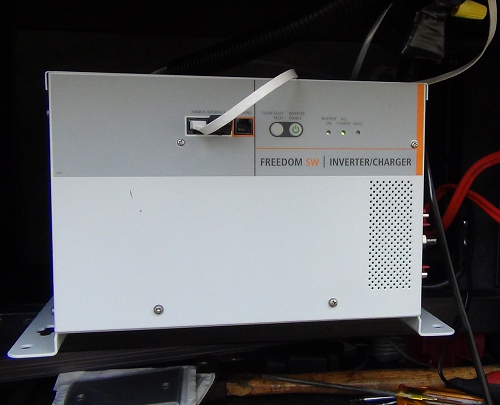 Inverter/chargers usually have much higher battery charging capability, often up to 100 Amps, and charge the batteries by simply reversing the inversion process when the RV is plugged in. The most important thing to be aware of with an inverter is capacity. Because the inverter must produce ten times the voltage when inverting from 12V to 120V, it also pulls ten times more current from the batteries. For example, if you are watching a TV that requires a 5 Amp AC draw, the inverter is drawing 50 Amps from the batteries. Although having an inverter installed in your RV is highly recommended, there are a few things to consider. First, due to the large current load required, inverters are unable to power large appliances such as air-conditioners, as the batteries would drain quickly. Generators or shore power are still required for this. Second, invest in a pure sine wave inverter, as regular inverters produce a square wave that can easily damage sensitive electronics. Finally, it is a good idea to incorporate a solar panel array with the inverter system. This provides for some battery voltage recovery while dry camping. Should inverters be left off when not in use? Always a good idea to avoid parasitic battery drain, especially during storage. No. They draw power and slowly drain your batteries. If your not using it, turn it off. If you have both a converter and an inverter which is recharging the battery when plugged to shore power? A properly installed aftermarket inverter/charger will have the converter disabled. Therefore, the inverter charger is active. Last sentence of 4th paragraph says “Inverter/converters usually have higher charging capability, often up to 100 amps”. I think you meant to say generators ! Thanks Dave for bringing that to our attention. We checked with Steve (the author) on the matter and he replied: “Nope. Large inverters have up to 100A charging capacity. The freedom inverter shown in the article photograph has a maximum charging current of 100A. I have been seeing ads for gasoline powered inverters that make little noise. Can you explain how they work? Great question! I will assume you are referring to inverter generators. These are regular generators with a twist. They produce AC voltage like a regular generator, but that is converted and rectified to DC voltage, smoothed, and inverted back to clean AC, resulting in pure sine wave AC. These generators also use advanced electronics that allow them to spin at lower speeds when power demand is lower. This results in much quieter operation and less fuel consumption. Although these are great devices, the term “inverter” is used in a slightly different context than a stand alone inverter, although both terms refer to creating 120 V AC from 12V DC. Note that inverter generators use both conversion and inversion. Regrading the power draw of the inverter of 10X, Wow! I have an electric fridge which is connected to an inverter but my monitor only reports 3 – 5amps when I think only the fridge is running. But my 2 Trojan 6V batteries drain to 12.2 or less over night so that may explain drainage. I think the 10x applies to going from 12v battery to 120v appliance. If your fridge is DC it should pull 1x if it is 120AC it will pull 10x. When inverting 12VDC to 120VAC, it is correct that the DC amperage from the battery to the inverter will be higher than the AC amperage from the inverter. For a given amount of power, the voltage to amperage ratio is inversely proportional. In a perfect world, the DC amperage would be 10X greater than the AC amperage. Because of naturally occurring power losses, the DC amperage will be slightly higher than 10X the AC amperage on a 12VDC to 120VAC system. This will also vary slightly based on the actual battery voltage to the inverter input. Former full-time RVer, 47 years experience in the Electrical Trade, including 15+ years as an Electrical Instructor. Please provide a list folks who provide services related solar, lithium batteries, and inverter/charger systems for RVs. Thanks. Does coach offer rode side service in case of emergency, truck problems, tire service, break downs, etc???? In Illinois or out of state?? What is the best 6 volt batteries to use in a class rv with residential fridge. So can I leave converter on if I switch to inverter? When boondocking I heard when using inverter to shut down converter. Problem is then I have no power to outlets. When converter flipped on my oulets have power. Confusing…. When boondocking or dry camping you do not have shore power I.e. hookups to to 120v. All you have are your batteries. Batteries will run your 12v system. If you want 120v you will need an ‘inverter’ (not a ‘converter’) that inverts the 12v from your batteries to 120v. So I’m guessing you are confusing the two devices, your not getting power to your outlets because your turning off your ‘inverter’ not your ‘converter’. Sorry, I guess I did not make it clearer. I have both a converter and inverter. When boondocking I plug the shore power into the 30 amp plug coming from the inverter. When I turn off the converter then turn inverter on I do not get any 110 power to any outlets. Yet when I turn converter on along with the inverter I get power to all outlets. But apparently I do not want to do this because of battery drain. How is it your boondocking but can plug into shore power? What we have here is a failure to communicate. I am not plugging the power cord into a shore power outlet . I am plugging it into the outlet for the inverter mounted in the RV. So, your inverter has a 30amp socket you can plug your 30amp plug into? I’ve never seen one of those.